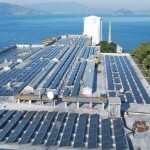 The Alcatraz microgrid stands as a model for installing modern energy technology under difficult terms. Historical structures had to be kept intact, equipment protected from the elements, and no new buildings erected. Here’s how developer Princeton Power Systems accomplished the task. Today, it’s also known for its unique, 400-kW solar microgrid, one that scaled some tough obstacles and was nearly two decades in the making. The island became unintentionally energy independent in the 1960s when a storm broke the electric cable to the mainland grid. After that, Alcatraz relied on diesel generators. But they created unpleasant air quality for tourists and fines for the park service. So in the 1990s, the park service began installing solar panels with the help of the Sacramento Municipal Utility District and the National Renewable Energy Laboratory. “They actually got as far as building some of the racking systems for the site. But then there were protests from historical preservation groups and they put the whole project on hold,” said Darren Hammell, co-Founder and chief strategy officer of Princeton Power Systems. The project was revived several years later when $3.6 million became available to solarize Alcatraz through the 2009 American Recovery and Reinvestment Act. 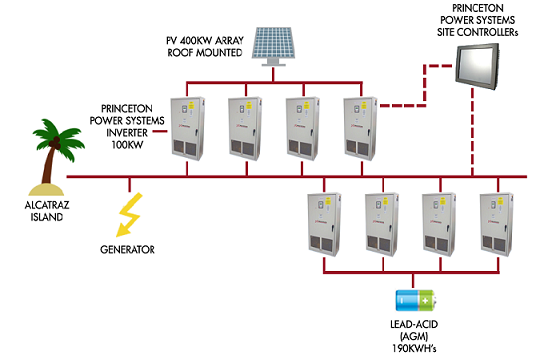 Princeton Power Systems entered the scene to design and provide equipment for the microgrid. This time, better options existed to make the 1,360 rooftop solar panels more discreet. Princeton Power Systems was able to install a flat system, invisible from the shore that didn’t damage “the look and feel of the landmark,” Hammell said. Still, it was not an easy project. Workers were carefully monitored by historic preservationist, who at one point threatened to sue for inadvertent damage to a concrete slab. Harsh conditions – wind, salt and fog – required protective encasement for equipment. But no new structures could be built. So modern electronics had to be tucked unobtrusively into historic enclosures. “We had to do some interesting things to protect the equipment from the elements. But it was done in such a way that it didn’t interfere with the existing structures. These advance batteries and inverters and electrical systems are all juxtaposed in older untouched structures,” he said. The Alcatraz microgrid powers not only the main prison building, now a museum, but also dozens of smaller structures, as well as a media room, lights and charging station for golf carts used for transportation around the island. The microgid equipment was integrated into the existing diesel system and uses wiring that was already there. An AC coupled system, the Alcatraz microgrid also is interesting from an electrical perspective. “Instead of using the solar power to charge the batteries and then batteries to supply the load, the solar directly supplies the AC microgrid. The solar power is generated directly into the grid, and the batteries are directly attached to the AC grid,” Hammell said. Princeton Power Systems designed the microgrid so that it can interconnect with the main grid, should another undersea cable be built. But at this time, it is more cost-effective for the island to rely solely on the solar microgrid, Hammell said. 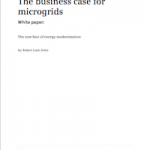 Because of its autonomy, the microgrid had be highly redundant. A master controller monitors the system to create maximize solar use and minimize use of diesel generators. If the master control system ever becomes damaged, each of the eight inverters in the system can operate autonomously. “Even if multiple components get compromised for whatever reason, each individual inverter will continue to power the islands load. So it provides a lot of redundancy if anting goes wrong,” he said. Because of the various challenges, the price tag for the Alcatraz microgrid was higher than it would be under normal conditions. Replicating the system at a less challenging site would cost about $4/watt, Hammell said. Business is good he says, with a dramatic escalation in the last 24 months, driven by the drop in solar prices, battery advances, and favorable policies in places like California and New York. So, Alcatraz a place full of history, may be making some more, this time as it advances microgrids. 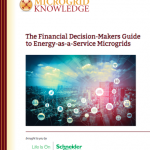 Read more profiles of microgrid projects by subscribing to Energy Efficiency Markets free newsletter.